I’m not going to lie, I resisted the idea of a capsule wardrobe for so long. I didn’t want to be restricted, or worse, not be able to shop. However, as I’ve gotten older (wiser…. :), I’ve found that having a more curated closet is THE ANSWER to feeling more ease and confidence when getting dressed. I’ve found that if I am more mindful about what I buy, I spend a lot less and I have more things to wear in the long run. It’s a lot simpler than I thought, and it is not restrictive, just more thoughtful. I spend less time worrying about what to wear each day and I have a lot more confidence in my personal style. Yay! Again, I take a more simplified approach to building my wardobe and showing my personal style, but the essential parts are very similar to a capsule wardrobe. I wanted to share some bloggers and particular posts that I have devoured myself and that have helped me refine this approach! These ladies are BRILLIANT and such an inspiration, I know you will love them, too. I’ve been a fan of Anna’s blog for years, but when she introduced her bold summer capsule I fell in love with her even more. She’s a busy mama of FIVE kids and I absolutely love how she uses color and bolder items in her capsule wardrobe. While most capsule wardrobes tend to be neutral, Anna isn’t afraid to add in really bold pieces, and I think she always looks unique and like herself. She also has a guide to building a Fall wardrobe, as well. I also love Elsie’s bold approach to a capsule wardrobe! She gives really detailed accounts and often recaps what works and what didn’t. While our styles are so different, I think her tips are so great and easily reproduced. She also does a great job of explaining how she plans her capsule’s. 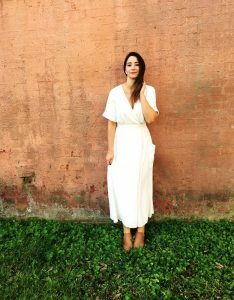 The first person to introduce me to a capsule wardrobe (or mindful style, as she calls it) was Caroline from Unfancy. Her capsules are always uber neutral and minimalist, but often not that far from my own daily looks. I LOVE how she breaks down how she incorporated different looks and why, and the process of creating a capsule. While she doesn’t do a strict capsule any longer (neither do I! ), her approach to dressing is still very similar. I lover her closet tour post and her post on how she broke away from a strict capsule lifestyle. I love how The Everygirl put together post on how to build a holiday capsule, how to build a jewelery capsule, and how to build a beauty capsule. And finally, Classy Yet Trendy is a GOLDMINE of information on capsule wardrobes. This is for those that want all the information, and it gives a ton of options for real life outfits. She has ebooks, and posts about how to create a classic closet, capsules for stay at home moms (raises hand! ), and even capsules for kids. That’s it! I also wanted to share that I have created a weekly newsletter where I will be sharing my daily looks, as well as how I style items in multiple ways. It will be streamlined and fun and full of inspiration and tips for YOU. You can sign up here or below.